University of Metropolitan FEFA and the Center for Advanced Economic Studies signed a cooperation agreement, which created the conditions for the good practices between these two institutions to expand and to provide FEFA students with a practical experience within the CEVES field of operations. 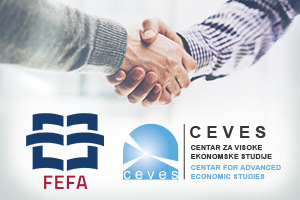 The agreement envisages the organization of student practices by CEVES, the promotion and exchange of knowledge and practical experiences between students and teachers of FEFA and associates and partners of CEVES. The contract was signed by the director of the Center for Advanced Economic Studies, Mr. Nemanja Šormaz and the dean of the University of Metropolitan FEFA Mr. Nebojsa Savić. The Center for Advanced Economic Studies highlights the satisfaction with the launch of this partnership and believes that cooperation will be beneficial to both sides and in the interest of acquiring practical knowledge of students.